What do virtually all Top-Producing Real Estate Agents have in common? They use Direct Mail to generate their business. Ask the top salespeople in your office, they�ll tell you they use real estate postcards, real estate calendars or real estate newsletters to market themselves. It�s no secret, and you can use Direct Mail to build your business too. Like any successful company, your business depends on 1 thing � getting customers. The simple truth is that no matter how good your service is, you won�t get someone�s business if they don�t know you exist. You need to advertise your services, let people know who you are and that you�re the one to call for their Real Estate needs. 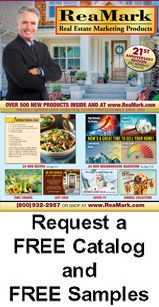 Advertising with ReaMark Real Estate Marketing Tools can be your vehicle to get your name out there and get the listings and sales to build your business. Hands down the single most important factor in Direct Mail and most other marketing plans is repetition. For example: What if I told you ReaMark can save you up to 42% on your Real Estate Marketing Products over other companies. Will you remember that next month or even tomorrow? Now what if I reminded you that every month for the next year. You�d probably catch on right? Repeat mailings establish your credibility. Each mailing makes you more familiar to your prospects, which helps to create a level of trust. Just as you are more likely to buy car insurance from a company you�ve heard of rather than from one you haven�t, your clients will be the same. A house is a huge investment for most, and people are more likely to trust you with it when they realize that your business isn�t a fly-by-night operation. Lastly, let�s face it: people procrastinate. Although they may be considering using your Real Estate services, some need more time than others to make a decision. While they�re thinking about whether or not to use you they can get sidetracked, and you�re info can get put aside. By sending monthly real estate postcards or real estate newsletters, you�re info remains in front of them, and it also serves as a constant reminder to buy or sell their home. Unlike a lot of other forms of advertising, you can target your audience with Direct Mail. Think about how many times you�ve seen ads on TV or in magazines for products that you would never buy because they are for men and you�re a woman or vice versa. With Direct Mail, you choose who sees your ads. By selecting a residential neighborhood of homeowners, or getting a list of closings from a title company, you are able to market strictly to people who buy homes. You don�t have to waste money on advertising to people that won�t buy a home, because your audience are already homeowners. Or, if you�re targeting first-time homebuyers you can mail strictly to specific apartment complexes. 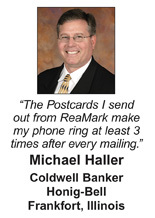 Either way, you know where each real estate postcard, real estate newsletter, real estate calendar, etc. is going. And by targeting your audience and sending repetitive mailings, you can expect an increased response. 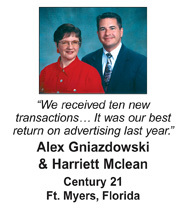 Direct Mail is the most cost-effective offline marketing medium to keep in touch with past clients and get new clients. It�s true. ReaMark can print and mail your existing and potential clients a postcard for as little as 34� each! Think about the thousands of dollars you could spend on other mediums such as newspaper/phonebook ads, T.V. commercials, bus stop ads, etc. None of these can give you the repeated market presence to your targeted audience that you need for as little cost. Also, take a look at our special offers to see how you can save even more on your marketing! On average, 8% per year of residential homes turn over in any given neighborhood. You should always check your farm area for this statistic. Look at all homes sold in the past year and divide by the total number of homes in the farm area. For example if 40 homes were sold out of a possible 500. That would equal 40/500 = 8%. The average cost for mailing 500 postcards plus postage is approximately 51� per card. It takes 6-8 months before a farm area begins producing results. So be patient and continue to mail! Research shows that if you mail your farm area on a monthly basis and the area you are farming doesn�t have another dominant realtor or agency, you could hope to get 0-10% of your farm�s total listings by the end of the first year, 10% to 20% during the second year, 15% to 25% in the third year and 30% or more after that. Research your farm area by pulling who listed homes sold in the past year or just drive around and look at signs. If one agent or company has over 75% of the listings, consider another area. If three or four agents sell consistently, then this area is prime for farming. The return on investment is fairly easy to calculate based upon the following national statistics and projected estimated response from postcards. b. 12 homes sold @ 3% = 36%. Total = 16 total homes sold @ 60% commission or 60% divided by 16 homes equals an average of 3.75% commission per listing. 4. If you send 500 postcards per month, your two year cost would be 500 postcards x 12 months = 12,000 with an average of 47� each = $5,640 or $2,820 per year. a. With just two sales in two years your commission would be $10,704, minus your cost of $5,640, this would yield a gross profit of $5,064. b. If you sold five homes in two years with a commission of $28,125, minus $5,640, the gross profit would be $22,485. c. And with 10 sales in two years your commission would be $56,250, minus $5,640, this result in a gross profit of $50,610.